The following is a list of basilicas (generally speaking a basilica is a large Church of special importance - prior to Christianity they were usually Roman civic buildings) recognized by the Roman Catholic Church that I found to be the most architecturally appealing. Exterior design was predominately considered and the list was made by only scanning available pictures so I apologize if I missed some you thought should be worthy. Surroundings, interior design and historical significance had somewhat of an influence on the rankings, but again, exterior design was the main attribute considered. 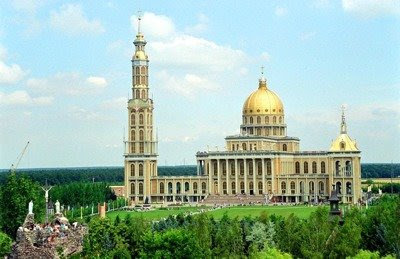 Full title: Basilica of the National Shrine of the Assumption of the Blessed Virgin Mary. 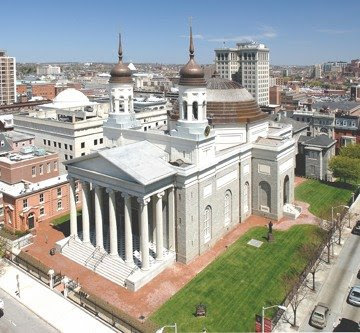 The Basilica of the National Shrine of the Assumption of the Blessed Virgin Mary, or more simply, the Baltimore Basilica, was the first major Roman Catholic cathedral built in the United States. It was designed by Benjamin Henry Latrobe, who also was enlisted by Thomas Jefferson to design the Capitol Building. Construction began in 1806 and was completed in a relatively short period of 15 years in 1821. The Cathedral is a monumental neoclassical-style building designed in conformity to a Latin cross basilica plan — a departure on Latrobe’s part from previous American church architecture, but in keeping with longstanding European traditions of cathedral design. The plan unites two distinct elements: a longitudinal axis and a domed space. 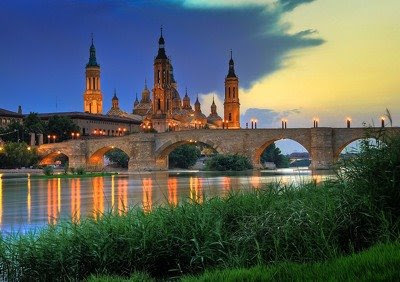 The Basilica of Our Lady of the Pillar is a minor basilica built in the 1st or 2nd century AD and sits on the banks of the Ebro. It is dedicated to Our Lady of the Pillar, the patron saint of Spain, who is said to have appeared to St. James in the 40 AD and gave him a small wooden statue and a column of jasper and instructed him to build a church in her honor. The statue atop the pillar is present in the church to this day. Amazingly, during the Spanish Civil War, three bombs were dropped on the church, none of which exploded. The architecture is of baroque style, and the present building was predominantly built between 1681 and 1872. 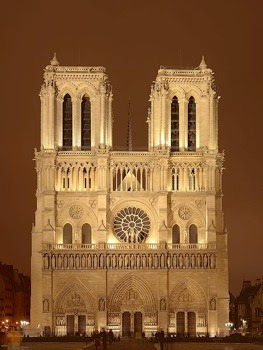 Notre Dame de Paris is the Cathedral of the Archdiocese of Paris and is widely considered one of the finest examples of French Gothic architecture in the world. It was one of the first constructed Gothic cathedrals and one of the first buildings to use flying buttresses for support. Construction began in 1160 on the Île de la Cité and was completed around 1345. The design also famously includes numerous gargoyles and grotesques incorporated into the rainwater gutter system as well as for ornamental purposes. The basilica was a target of vandalism throughout history, most recently during the Second World War and a restoration project is currently underway to restore the church to its highest degree of magnificence. 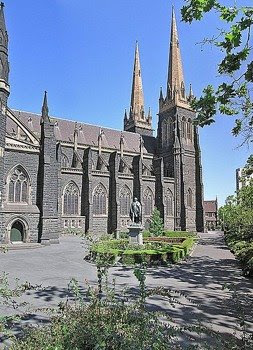 St. Patrick’s Cathedral of Melbourne is internationally known as a leading example of the Gothic Revival style of architecture and it the cathedral church of the Archdiocese of Melbourne. Construction began in 1858 and, due to long and frequent economic delays, was not officially completed until 1939. The church is the tallest in Australia and was dedicated to St. Patrick as the Catholic community in Melbourne was almost entirely Irish when construction began. 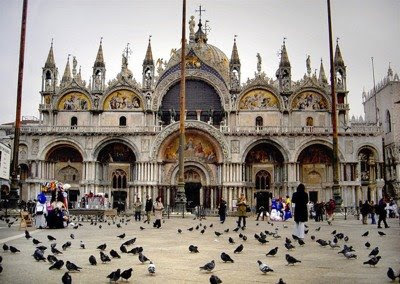 St. Mark’s Basilica is Venice’s most famous church and one of the best known examples of Byzantine architecture. Churches on the site date back to 828 but construction of the current building did not start until 1063 and was not consecrated until 1094, with constant additions throughout its history with an official completion date of 1617. It was presented as a status symbol of Venetian wealth and power and from the 11th century onwards, the building was known by the nickname Chiesa d’Oro (Church of gold). 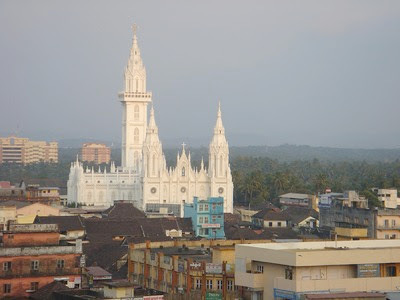 The stunningly white Basilica of Our Lady of Delours is located in southern India and is the biggest in tallest church in Asia. The church began construction in 1929 and was consecrated in 1940, yet the tallest of the towers was not completed until 2007 and was dubbed the Bible Tower. The basilica was built in an Indo-Gothic style with three large towers, the tallest of which is 260 feet high. The red cross atop the Bible Tower is lit at night and can be seen from miles away. The church is dedicated to Our Lady of the Dolours in reference to the Blessed Virgin Mary and the seven sorrows of her life. Notre-Dame de la Garde is a basilica located in Marseille, France. 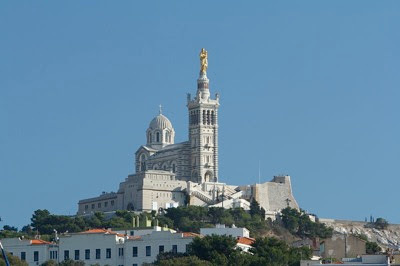 This ornate Neo-Byzantine church is situated at the highest natural point in Marseille, a 162 m (532 ft) limestone outcrop on the south side of the Old Port. As well as being a major local landmark, it is the site of a popular annual pilgrimage every Assumption Day (August 15). Local inhabitants commonly refer to it as la bonne mère (”the good mother”). The church was built between 1853, when the foundation stone was laid on September 11, and 1864. The church was built on the site of a 13th century chapel, also dedicated to Our Lady of the Watch, the traditional guardian of seafarers. The basilica is surmounted by a 60 m (197 ft) belfry topped with a huge statue of the Virgin and Child, visible across much of the city and for miles out at sea. Construction of the basilica took five years and required 170,000 tons of material, including 23 shiploads of marble and porphyry from Italy. The Basilica of Our Lady of Lichen is located in the village of Lichen Stary near Konin in Poland. It was designed by Barbara Bielecka and built between 1994 and 2004. The construction founded entirely from pilgrims’ donations. With the central nave 98 meters tall, 120 meters long and 77 meters wide, and with a tower 141.5 metres tall, it is Poland’s largest church and on of the largest churches in the world. The church is dedicated to Our Lady of Sorrows whose icon, dating back to the 18th century, is displayed in the basilica’s main altar. It is one of Poland’s principal pilgrimage sites. 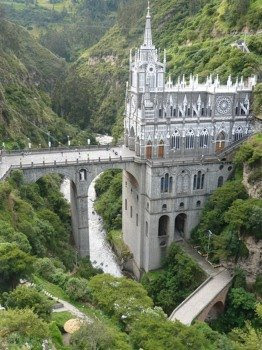 Las Lajas Cathedral is a cathedral located in the municipality of Ipiales and built inside the canyon of the Guaitara River. The architecture of this cathedral is of gothic revival architecture built from January 1, 1916 to August 20, 1949, with donations from local churchgoers with the intention to replace an old 19th century chapel. The story of the cathedral’s creation is that in 1754 an Amerindian named “Maria Mueces” and deaf-mute daughter “Rosa” were caught up by a very strong storm. They found refuge between the gigantic Lajas and to Maria Mueces surprise the girl exclaimed “the mestiza is calling me…” and pointing to the lightning illuminated painting over the laja. The Basilica of Saint Peter, officially known in Italian as the Basilica di San Pietro in Vaticano is located within the Vatican City. 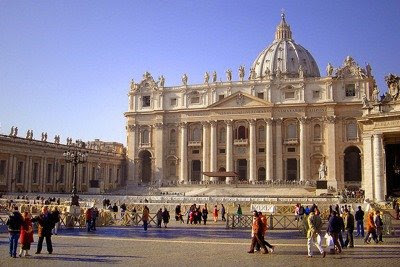 St. Peter’s has the largest interior of any Christian church in the world, holding 60,000 people. It is regarded as one of the holiest Christian sites and has been described as “holding a unique position in the Christian world” and as “the greatest of all churches of Christendom”. In Catholic tradition, it is the burial site of its namesake Saint Peter, who was one of the twelve apostles of Jesus and, according to tradition, first Bishop of Rome and therefore first in the line of the papal succession. Tradition holds that Saint Peter’s tomb is below the altar of the basilica. There has been a church on this site since the 4th century. Construction on the present basilica, over the old Constantinian basilica, began on April 18, 1506 and was completed on November 18, 1626. It is associated with the papacy, with the Counter-reformation and with numerous artists, most significantly Michelangelo. As a work of architecture, it is regarded as the greatest building of its age. 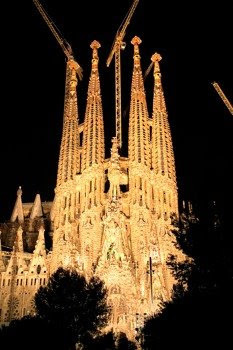 The Temple Expiatori de la Sagrada Família, often simply called the Sagrada Família, is a massive, privately-funded Roman Catholic church that has been under construction in Barcelona, Catalonia, Spain since 1882 and is expected to continue until at least 2026. Considered the master-work of renowned Catalan architect Antoni Gaudí (1852–1926), the project’s vast scale and idiosyncratic design have made it one of Barcelona’s (and Spain’s) top tourist attractions for many years. A portion of the building’s interior is scheduled to open for public worship and tours by September of 2010. The construction budget for 2009 alone is € 18 million. Since it is not yet open, it is not officially recognized by the Vatican as a basilica, but it this should change as the church nears completion.